Quiet yet convenient to Branson attractions and featuring free breakfast and a seasonal outdoor pool the Lodge at the Falls Branson is an affordable lodging option that is among the most popular hotels in Branson among our guests. The two-story brick hotel features 115 exterior-access rooms. Standard room amenities include free Wi-Fi mini-fridges coffeemakers and hair dryers. Non-smoking and accessible rooms are available and pets are welcome for an additional fee. The Lodge has a cozy lobby with a widescreen TV and a business center. 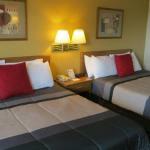 Located just south of Highway 76 the hotel is 15 minutes from downtown Branson. Table Rock State Park is one mile away and the College of the Ozarks is seven miles from the property. The Lodge at the Falls is 14 miles from Branson Airport.